Just In: The Albacore Tuna is in close so we're fishing them like crazy. 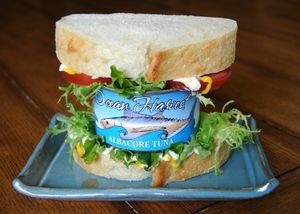 We also have special flavors including peppercorn albacore, pesto albacore, smoked albacore & Jalapeno albacore. Canned Dungeness: We hand pick the best dungeness crab for our catch for our premium canned crab. Only the freshest live crab go into the cans and we take a lot of care to give you the best of the Pacific. Each can has roughly 1/2 claw, leg meat and 1/2 body meat. We're sorry they are so expensive, but it takes a LOT of labor to pick and can the crab, and you are only getting the best crab we have to offer. If you want the very best canned dungeness crab available this is it.